Arriving at the seaplane terminal, fresh off your flight into the Maldives, you’re ready for some relaxation and fun in the ocean kingdom. You’re heading to Conrad Rangali – the multiple award-winning hotel, recently voted one of the top ten in the Indian Ocean. Heading into the Conrad lounge, your suspicions are confirmed. As you help yourself to complimentary coffee and breakfast and settle back in your white leather lounger; as you enjoy your complimentary massage; as you gaze out at the seaplanes bobbing outside the window – this is serious stuff. Taking off on the 30 minute flight to South Ari atoll, you are again struck by the reality that greets you from your little window. There they are, just as you’d dreamed – the unforgettable islands of the archipelago spread out before you. But this is not a screensaver. There will be no pop-ups. Catching a glimpse of your destination through the cockpit as the plane dives down into the lagoon you see two palm fringed islands joined by a 500 metre footbridge, towards the middle of which your plane heads after splashing down. To the left is Rangali island, with its secluded water villas and beachfront dining, while to right is Rangalifinolhu, where you’re staying in one of Conrad’s recently refurbished beach villas. Renovated at an expense of $3.2 million dollars, your hosts mean business. Entering the villa, you’re immediately struck by the grandeur as the spacious living and sleeping area opens out onto a sliding bay window fifteen feet in height. 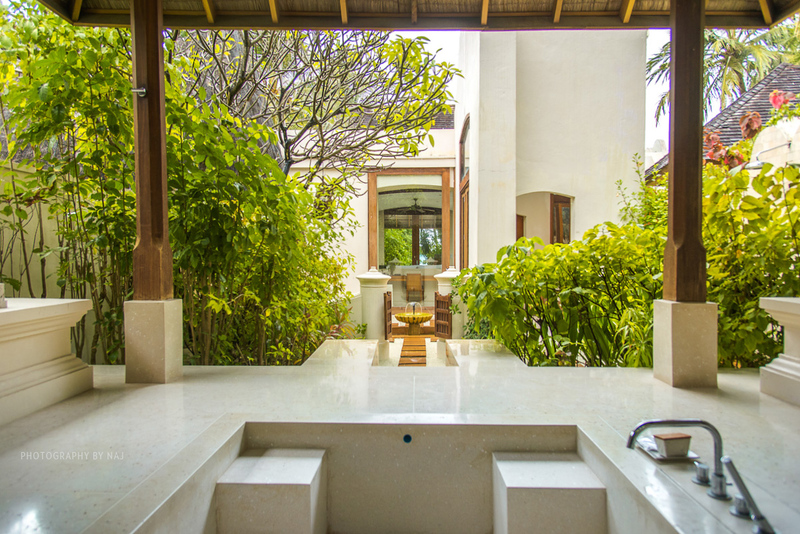 At the rear of the villa, past the outdoor rain shower lies a bathtub doing a fine impression of a bathing temple, raised up beneath a pagoda surrounded with luscious green. This is not a place for the average bath. Back inside you have your own wifi connection, iphone dock, coffee maker, 3D HD blu-ray player, 32 inch flat screen TV and even your own sunroof. 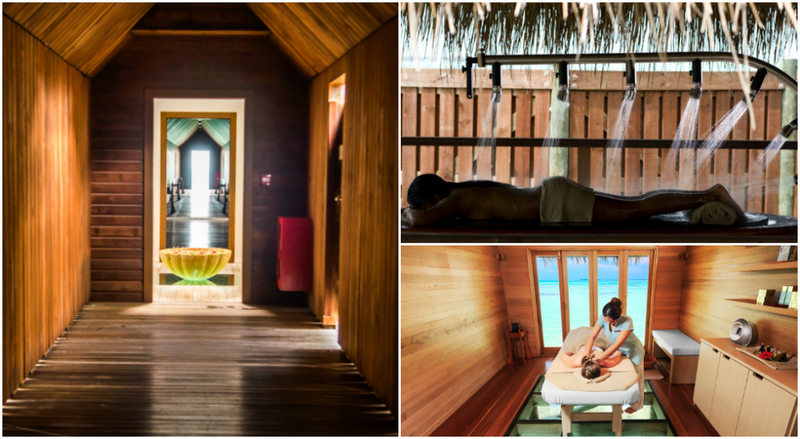 There are beach villas and there are beach villas – Conrad Rangali opts for the latter. 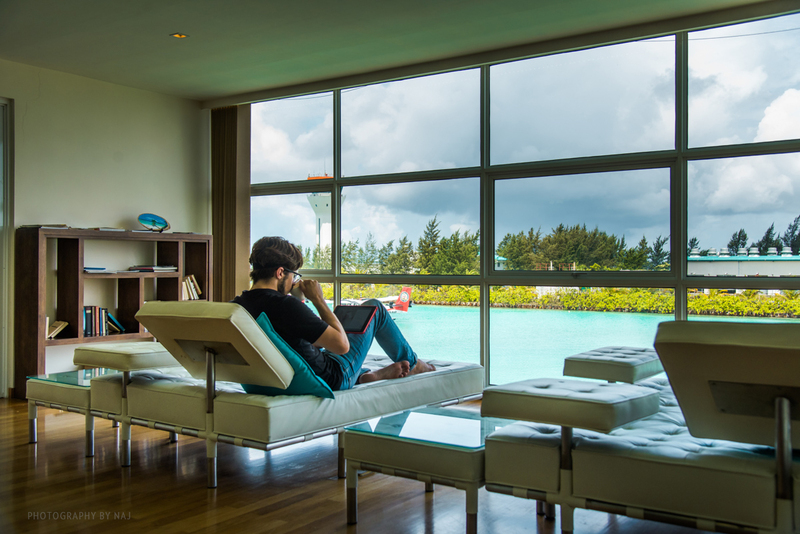 A few doors down the beach – one of a dozen different types of rooms available – are the 7000 sq. ft beach suites with two rooms, two private plunge pools, and their own private back door to the beach. One step up from the neighbouring villa, the open air bathtub here takes around 45 minutes to fill, during which time guests can order a custom bathing ritual, with candles, aromatherapy, or champagne…it’s your fantasy. A leisurely stroll – or a regular ferry ride – away on Rangali island, the resort’s selection of water villas look over the breaking surf and brilliant sunsets. Back on Rangalifinolhu, the spa retreat area stretches out from the northern end of the island. The wooden structure includes 9 rooms either side of a shaded corridor ending in a piercing rectangle of sunshine at the end of this labyrinth of leisure. Depending on the door you choose, you will be treated to any number of massages, facials, scrubs and treatments – including a ‘vichy’ shower, which words can’t really describe. Either way, they aren’t taking any chances with your wellness here. This collective quality extends to the spa retreat area’s own restaurant where things go up another level as Conrad shows you its dedication to dining. ‘Mandhoo’ restaurant lies opposite the spa, and for good reason. With a menu themed to correspond to the five elements of Greek philosophy, diners can choose from dishes corresponding to their emotional and physical needs – nutritionists and spa therapists are on hand if needed. A dish’s taste, temperature and moisture will determine whether you wish to choose from the energising ‘air’ option, nourishing ‘earth’, detoxifying ‘fire’, relaxing ‘water’ or fortifying ‘plant’ menus. If this doesn’t leave you impressed, perhaps the pioneering ‘Koko’ teppanyaki grill dug into the sand on Rangali island will. Should you have any remaining doubts as to Conrad’s commitment to cuisine, it’s probably time you took a trip down to ‘Ithaa’. 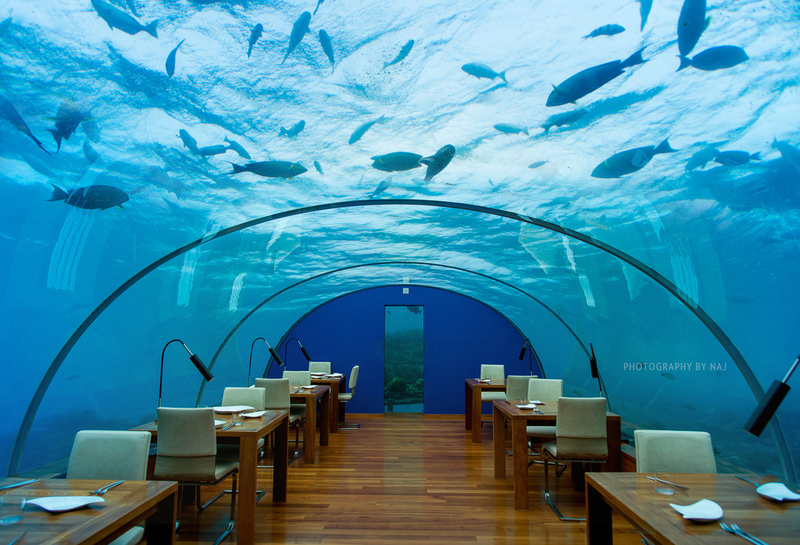 Famed internationally, the world’s first underwater restaurant, ‘Ithaa’ is the jewel in Conrad’s culinary crown (or pearl, according to the Dhivehi translation). Having been described as the most beautiful restaurant on earth, it’s hard to eat much on the first visit with your mouth wide open the whole time. Lobster, caviar, quails eggs, a 270 tonne structure, five metres below the surface; it’s not likely you’ll ever dine like this anywhere else. In fact, it’s unlikely that many of the things you do during your time at Conrad Rangali island will be bettered elsewhere. This is a resort without half-measures and where your luxury is in the hands of professionals…a seriously incredible place to spend your holiday! The Conrad Maldives Rangali Island Hotel is located in the Alifu Dhaalu Atoll of the Maldives. 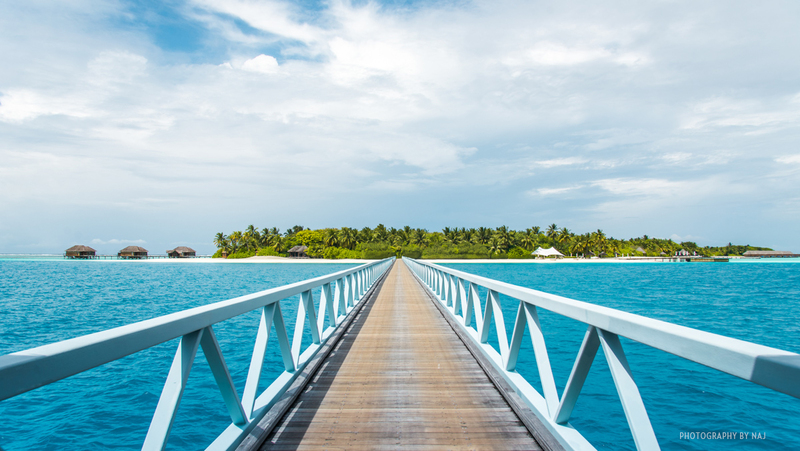 The Maldives comprises over a thousand islands, with stunning reefs and remote, exotic locales. The coral, sea life, and warm waters of the Indian Ocean make the area one of the world’s best diving destinations. Arrivals at the Male International Airport are met by Conrad Maldives Rangali Island staff and take a 30-minute seaplane trip to the resort.